Jost Van Dyke has an alluring reputation. The smallest of the four main British Virgin Islands, some say that it is named after an ancient Dutch pirate. 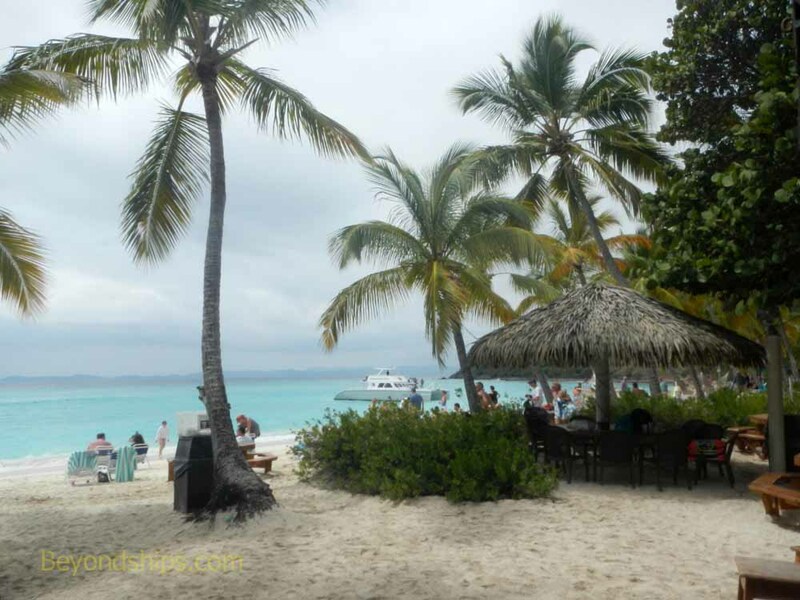 Each New Year's Eve, hundreds of private boats and yachts come to Jost Van Dyke to party. It is the subject of a country song by Kenny Chesney. A secluded tropical paradise, it is a haven for celebrities and beachcombing adventurers. Consequently, a shore excursion entitled an “Escape to Jost Van Dyke” has an intriguing sound. This was not a sightseeing tour of Jost Van Dyke. Although this island is only a few square miles, it does have some settlements, the largest of which is Great Harbour. Volcanic in origin, the island also has some undeveloped green mountainous peaks. However, none of these attractions were on the itinerary. Rather, our objective was to spend some time at White Bay beach. Known as one of the top beaches in the Caribbean, White Bay has been called the quintessential picture postcard beach. The only way to get to Jost Van Dyke is by sea. For most people, this means a ferry from Tortola or St. John or a private boat. However, our tour used a powered catamaran called Rebel Yell. We met the catamaran at the cruise ship pier in Tortola. Even though this was a gray day, the 30 or so guests arranged themselves around the boat. Some sat in front in the netting between the boat's twin hulls. Others spent the half hour that it took to get to Jost Van Dyke sitting in a sheltered area aft. Yet another option was to climb up to the bridge, which is protected from overhead sunshine but otherwise open to the elements. There, the captain answered questions about life on the islands and pointed out the landmarks. The boat proceeded along the south coast of Tortola and then at the end of that island turned up the channel towards Jost Van Dyke. Along the way. we could see Norman Island (the inspiration for Robert Louis Stevenson's Treasure Island), St. John and off in the far distance St. Thomas.